No injuries reported as two missiles fired at southern Israel, latest in upswing of Arab Muslim attacks. 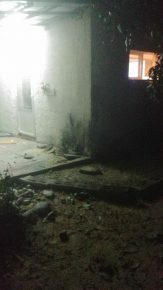 A rocket fired by a terrorist group in the Gaza Strip struck next to a home in an Israeli community north of the coastal enclave on Sunday night, causing damage but no injuries, according to media reports. The army confirmed that two rockets were launched from the Gaza Strip and struck inside Israel, in the Hof Ashkelon region. Police said that one rocket hit inside an Israeli community, the other struck an open field, causing neither damage nor injury. The names of the communities were not immediately cleared for publication. A photograph emerged on social media appearing to show the damage caused to the house. An outside wall was charred and several concrete tiles surrounding the home were destroyed.